Do you find yourself on the computer, reading, or looking at your phone for 2 or more hours a day¹? Do you find your eyes watery, physically sore or tired, and possibly with headaches by the end of the day after all this near work? If you answered yes to any or all of these scenarios, you may be experiencing eye strain. The reality is, in today’s digital world, we are not only subjected to reading, and writing in hard copy form, but also on our computers, tablets, and smart phones. While digital devices produce eye strain all within their own right, doing any kind of extended near work can cause symptoms of eye strain. Unfortunately, many of our everyday tasks can cause eye strain. Eye strain is essentially the overworking of our ocular focusing system while performing near work. The term “Accommodation” in ocular terms is the ability for our ocular muscles to appropriately adjust focus to a specific distance³. However, when applying stress to our accommodation system, we are forcing our muscles to work consistently for hours on end without relief. 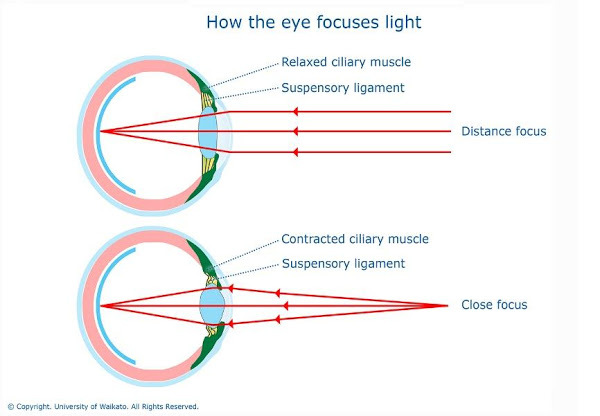 Our ocular muscles just as any other muscle in our body fatigues and subsequently cause strain and discomfort. Two of the most common causes of fatigue we hear of at Eyes of the Marina Optometry are from digital device use and studying habits for work and school. Because we are located in Marina del Rey, 3 short miles from Playa Vista’s Silicone Valley, digital device usage is a part of everyday life. Additionally, Eyes of the Marina Optometry is conveniently located between both the University of California, Los Angeles, and Loyola Marymount University where students are consistently required to switch between near and distant work for lectures and coursework. What is the solution to eye strain? Fortunately, there are simple solutions for eyestrain. Traditionally it has been recommended to practice techniques of relaxing accommodation with the “20-20-20” rule¹. The rule dictates that for every 20 minutes of near work you look 20 feet away for 20 seconds to relieve your eyes, the reality is, that regimen is likely unpractical and cumbersome for most¹. A more lifestyle friendly and modern solution is a pair of relaxing lenses appropriate for your near work demands. At Eyes of the Marina Optometry, our optometrists Dr. Gozini, and Dr. Pham work diligently to not only find accurate prescriptions for all our patients but also provide the option for relaxing lenses. A relaxing lens does just as the name suggests, it relaxes the accommodative system so that eyes can focus on doing near work for not only longer periods of time but always in comfort. The mechanics of a relaxing lens is essentially an extra power added to the bottom portion of a lens to relieve eye strain4. Unlike traditional progressive lenses, relaxing lenses do not take as much visual training and do not produce any distortion⁴. Relaxing lenses can be added to any frame or lens design to create the perfect combination of comfort and style⁴.